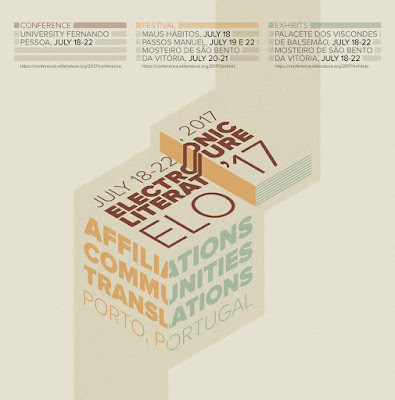 The ELO (Electronic Literature Organization) is pleased to announce its 2017 Conference, Festival and Exhibits, to be held from July 18-22. The Conference is hosted by University Fernando Pessoa, Porto, and the Festival and Exhibits will be held in the center of the historic city of Porto, Portugal. Titled «Electronic Literature: Affiliations, Communities, Translations», ELO'17 will welcome dialogues and untold histories of electronic literature, providing a space for discussion about what exchanges, negotiations, and movements we can track in the field of electronic literature. The three threads (Affiliations, Communities, Translations) will weave through the Conference, Festival and Exhibits, structuring dialogue, debate, performances, presentations, and exhibits. The threads are meant as provocations, enabling constraints, and aim at forming a diagram of electronic literature today and expanding awareness of the history and diversity of the field. Our goal is to contribute to displacing and re-situating accepted views and histories of electronic literature, in order to construct a larger and more expansive field, to map discontinuous textual relations across histories and forms, and to create productive and poetic apparatuses from unexpected combinations. Electronic literature is trans-temporal. It has an untold history. Topics: Multiple diachronic and genealogical perspectives on electronic literature, providing room for comparative studies; Untold archeologies and commerces between electronic literature and other expressive and material practices; Intermedia and ergodicity in Baroque poetry, futurism and dada; concretism, Videopoetry and Fluxus; Videoart and soundart; and how these expressive forms are recreated and transcoded in digital forms of literature; Early experiments in generative and combinatory literature; Performances mapping the aesthetic and material antecedents of electronic literature; Attention to remixing/re-coding of previous materials from the avant-gardes. Electronic literature is global. It creates a forum where subjects in the global network act out and struggle over their location and situation. Topics: Expanding our understanding of electronic literature communities and how literature is accounted for within diverse communities of practice; Case studies of individual communities as well as broader engagement with how communities form and develop, and how they interact with and create affinities with other communities; Comparative case studies: Artists’ books; Augmented and Virtual Reality; Perl poetry; Sound-video practitioners; ASCII art and Net.Art; Hacktivism/Activism; Memes and Fan Fiction cultures; Minecraft, Twine, Bots and Indie Gaming; kids' e-lit; and how these practices are connected to electronic literature. Performances engaging with the diversity of practices in electronic literature and affiliated communities, as well as their critical awareness of network aesthetics. 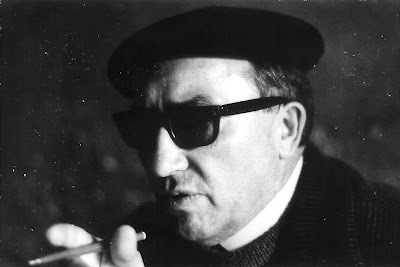 Electronic literature is an exchange between language and code. It contains many voices. Topics: Electronic literature as translation in the broadest possible sense; Beyond interlinguistic translation: emulations, virtualizations, re-readings, and interpretations; Limits and specifics of the programmability of natural languages as a means of literary expression; Plagiotropy; Linguistic, intermedial and intersemiotic translation; Code and text translation; Generative literature and emulations of historic electronic literature; Re-readings and interpretations of previous works; How these activities expand our understanding of literature and textuality; Performances addressing linguistic reflexivity and their engagement with translation, broadly understood, i.e., as a transcoding mechanism involving exchange in and across media, languages and cultures.